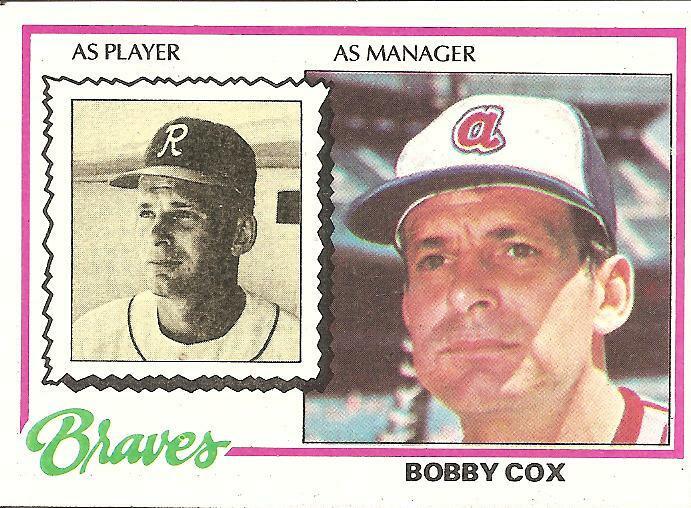 Bobby Cox was a manager of the Atlanta Braves for a little while in the late 1970s and early 1980s. Before that, he’d been a marginal major leaguer, briefly appearing in some games for the New York Yankees during a rare down time in the history of that franchise. It’s not clear from his short stint with the Braves back when I was a kid if he knew much about managing. The team had been pretty bad for a while, and he wasn’t able to do much to change that, losing 93 games his first season of 1978, when this card came out. He lost 94 games the following year. In 1980, he led the Braves to an 81-80 record, but the next year they dipped below .500 again and Cox was fired. This is what happens to managers. They come and go. My childhood connection to baseball ended during Cox’s doomed 1981 season, when I stopped buying cards, so I’m not sure whatever became of him. Probably he drifted back to the minors or into scouting or left the game altogether to get a job at his brother-in-law’s muffler shop. Is there any job less stable than that of a major league manager? The great majority of major league managers, guys who come and go so quickly you barely remember they were ever here—like this hazy Bobby Cox character from my youth—makes me wonder about the extremely rare managers who find a way to not only endure but thrive. What is their secret? Everything in life is so tentative and fleeting, and in the major leagues this fundamental characteristic of the universe seems amplified and exacerbated, and yet there are these rare figures in the game who somehow find a way to put down deep, fruitful roots in the most volatile soil around. Longevity as a manager, which is necessarily connected—given the unforgiving nature of the profession—to consistent excellence as a manager, has to be an important component in deciding on the best manager in baseball history. Maybe it’s the most important component. The tendency in the managerial profession is toward disappointment and disintegration. Who has been the best at transcending this tendency? Is that little baby “a” the worst hat logo ever? Doesn’t Walter Alston have to be one of the top three? The circumstances of the longevity also matter. 22 one-year contracts (including 8 All-Star Games managed) gives him my vote. As much as I hate to admit it, LaRussa also would be in the mix. Longevity as a manager, not just for one team, means something. And certainly the modern version of Cox. And let’s not leave out Stengel. OK, so Alston is in the top FOUR. The “modern” era of baseball precludes some of the game’s stalwarts, McCarthy, Mauch, Mack, etc. etc. etc. As a Yankee fan, I love that they just used a picture of him at Yankee Stadium (he was a Yankee coach in 1977, winning his first world series ring) and just airbrushed his photo, so it looks like the Braves are at Yankee Stadium. The man never skipped a beat. Always loved his story… A week after Atlanta fired him, the Blue Jays hired him & then he led them out of the cellar dweller syndrome, eventually landing in the ’85 ALCS. Then he chose to go back to Atlanta as GM for about 5 years, building a good group of young players. In the middle of ’90, he fired the Braves manager & stepped in as manager himself…we all know how that turned out. He built the great Braves of the 90’s and then managed them on the field. How cool is that? Random thoughts about managers: I think Whitey Herzog was one of the best. Red Schoendist, while not an all-timer, was a class act. Oddly, and for reasons I can’t explain, I really liked Cookie Rojas when he managed the Angels in 1988, though they were only 75-79. The guy who should be given another shot at managing is Glenn Hoffman–he took a just-under .500 Dodger team in the midst of wrenching organizational change in 1998 and led them to a winning season. Joe Torre is not one of the all-time great managers, nor is Gene Mauch. It is interesting that “as player” he’s shown as a minor league player who’d yet to play in the majors, and “as manager” he’s shown as a coach who’d yet to manage in the majors. As was said above, the manager shot was from ’77 at the newly remodeled Yankee Stadium. The player shot must be from when he was on the Richmond Braves in 1967. Can’t really tell home/road, but the piping suggests a clean white uni (at least in my mind–plus, any kind of official photography I would think would be done at home), so I’d guess the shot is from Parker Field. Really cool gallery of it here — http://www.digitalballparks.com/International/Parker1.html –judging by the fact that the opponent is “Peninsula,” the shots have to be from ’72 or ’73, when the Peninsula Whips were in existence in the International League. And picture 7 there kind of matches this card with its boxy first base dugout. Despite my name I am a lifelong Cardinals fan. Red Schoendienst has always been a class act. Whitey Herzog was a great manager and an even better evaluator of talent. Tony LaRussa is highly overrated. With the talent that management has provided him with he should have been more successful than he has been. The team often wins, not because of him, but in spite of him. Unlike Bobby Cox, young players despise playing for him and he returns the favor. Fitting that I’m reading this a few minutes after the Giants gave Bobby Cox a brief, classy salute in the minute following the Giants’ NLDS win. Although I’ve known about Cox first managing the Braves in the late-’70s, I cannot for the life of me remember knowing who he was or having an image of him from this period. All I can think of are those mediocre and worse players and those weird uniforms.